As our world grows increasingly complex, and digital transformation remains top of mind for businesses in every industry, technology professionals are working around the clock. Tech pros work tirelessly to solve any problem thrown their way, no matter the issue's size — from helping an individual send a large file, to patching critical enterprise vulnerabilities, to solving latency issues beyond the firewall, or fixing application performance problems, technology professionals are often the unsung heroes of modern business. While we certainly appreciate IT pros year-round, there is often a lack of understanding by business leaders and end users as to just how critical their responsibilities are, and the complexities associated with their day-to-day roles. The problem is, the job is never done. In fact, tech professionals have so much on their plates that the 2018 SolarWinds IT Trends Report: The Intersection of Hype & Performance found that over half of all tech pros surveyed spend less than 25 percent of their time on proactive optimization of their environments. But, what if that wasn't the case? 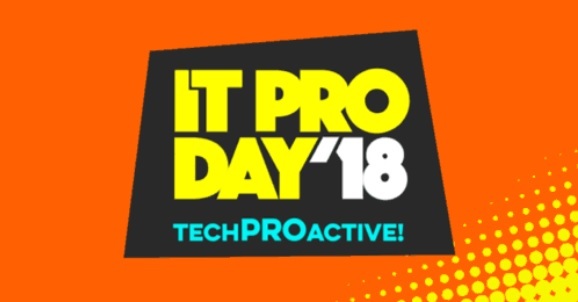 To celebrate IT Professionals Day 2018 (this year on September 18), SolarWinds commissioned its fourth annual survey to empower technology professionals with the freedom to think bigger than their day-to-day tasks. The SolarWinds IT Pro Day 2018: A World Powered by Tech Pros survey explores a "Tech PROactive" world where technology professionals have the time, resources, and ability to use their technology prowess to do absolutely anything — from improving their IT environments, to addressing global societal challenges, and even enhancing their personal lives (turns out, virtual reality can work magic at work and at home). ■ Nearly 70% of tech pros surveyed respond to one-off user requests on a daily basis. ■ Over half (51%) of tech pros respond to help desk tickets on a daily basis. ■ Even when they have time to be proactive at work, researching new technologies that will benefit the end user is still the number one priority (by weighted rank). 1. Home DIY projects: Such as using virtual reality (VR) to visualize a kitchen remodel before implementing changes. 2. Managing finances: By using machine learning (ML) to grow investments and diversify their portfolio. 3. Vacation planning: Such as utilizing cloud-based services to store and link travel data, and using IoT-based devices to generate real-time insights while on the go. In our IT Professionals Day 2017 survey, Little-Known IT Pro Facts, it became clear that technology professionals are the backbone of our businesses. The 2018 survey shows that this trend has continued, and envisions technology pros' ambition to better the workplace, the world, and their personal lives through the use of technology. Make sure to thank a tech pro on September 18, or any day, to acknowledge the ways that they make your day-to-day life better.